Heavy duty roller conveyor equipment from IMS. 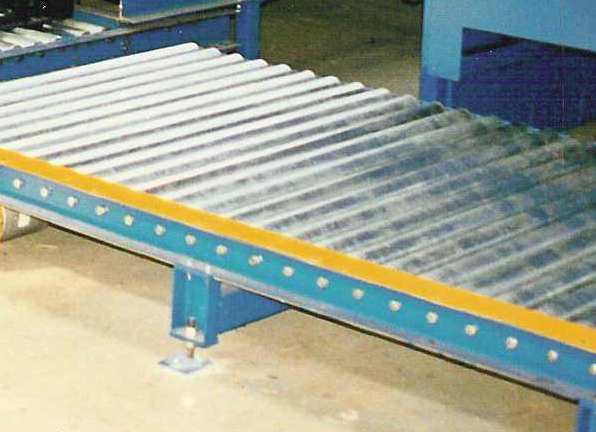 The IMS roller conveyor utilises 63.5mm diameter rollers set at 76mm pitch for all widths up to 2.2m wide. For widths between 2.3m and 3m we offer 70mm diameter rollers set at 76mm pitch. 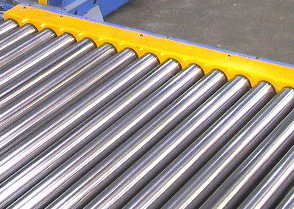 Our non-powered roller conveyors may be easily modified at any time to be fully powered and accumulating simply by the addition of suitable drive cartridges as required. The top of roller height is adjustable but our standard height is set to 310mm from floor level which is the industry standard. The IMS powered lineshaft roller conveyor utilises 63.5mm diameter rollers set at 76mm pitch for all widths up to 2.2m wide. For widths between 2.3m and 3m we offer 70mm diameter rollers set at 76mm pitch. 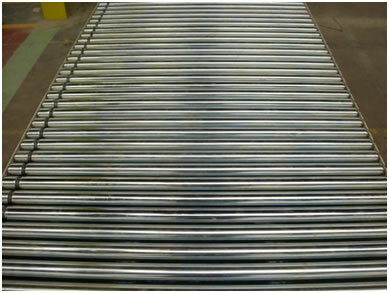 Each conveyor has a lineshaft running below the load carrying rollers. The load carrying rollers are positively located into slots in the sideframes by 15mm diameter captive spindles which can be easily removed for cleaning and maintenance. 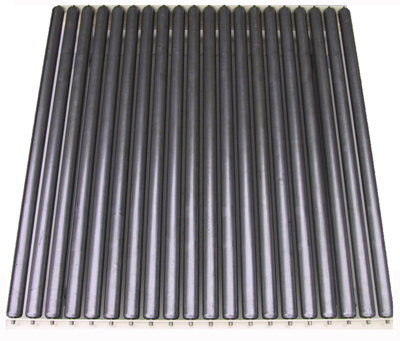 The lineshaft is manufactured from high quality steel to ensure concentricity along its complete length. It is supported by precision bearings at given centres to eliminate deflection. The Lineshaft is driven by an electric geared motor mounted within the sideframes. The drive is transferred to the rollers by means of a polyurethane endless drive belt providing individual drive to each roller. Each conveyor has an assembly of chain driven wheels running below the top load carrying rollers for the full length of each conveyor section. The load carrying rollers are positively located in the sideframes by hexagonal spindles and can be easily removed for cleaning and maintenance. On raising, the drive wheels automatically centralise about the rollers to provide a smooth even drive to the load carrying rollers. Zero pressure accumulation is achieved by progressively lowering air bags supporting the wheel spindles. This removes the drive from the load carrying rollers thus stopping the load within the zone. 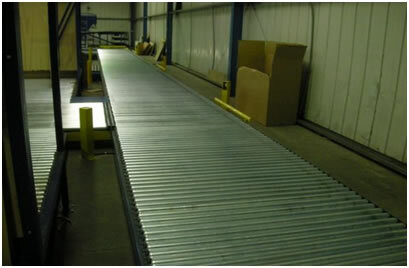 This IMS roller conveyor utilises 76mm diameter rollers set at 89mm pitch for all widths up to 3m wide. 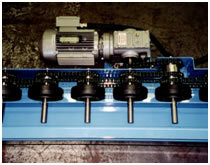 Each high capacity roller incorporates precision bearings and a duplex sprocket. Rollers are driven on the one to one principle by simplex transmission chains. Each conveyor section has its own independent geared motor drive contained within the overall width of the conveyor. When load accumulation is required the conveyor length is divided into a series of independently driven units. Zero pressure accumulation is achieved by stopping the drive to each unit in sequence thus positively holding the load in each section. System control is by PLC and inverters may be used where smooth transport of loads is required.